In the past few months, we have had a chance to review hundreds of applications available for iPhone. There are plenty of creative, 3D applications available on this platform, but the quality of music apps has been surprising to say the least. There are plenty of music apps that let you play your favorite instruments on your phone and have fun day in and day out. iGOG: Massive Drums is one of those apps. 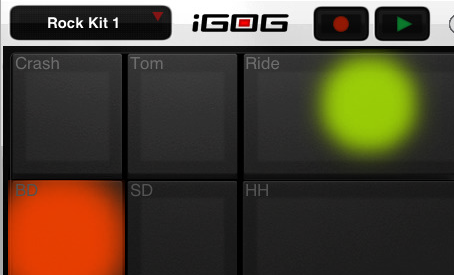 iGOG is a cool virtual drum machine that features 384 multisampled drum hits per pad. It may not be the real thing, but the sound certainly comes close. iGOG takes advantage of a patent pending technology (VelAucity) that makes this app more responsive to your touch. The fun thing about this app is that the harder you strike the pads, the louder the drum hit will be. Of course, you don’t want to touch the pad too hard for obvious reasons (VelAUcity is not available for iPod Touch). You get 6 free drum kits with this app, and you can purchase more through the interface. You can also load your own material by uploading a wav, air, or gog files. The built in sequencer is fun to play with as it give you yet more options to customize iGog. And who can forget about the built-in file transfer mode that lets you share files between the app and your computer easily. All in all, if you are into drumming, this is one app you should try.